[It is a] mighty privilege, for a man to create a hundred pounds with the stroke of a pen. 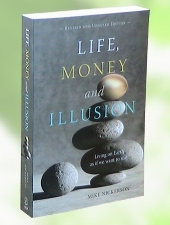 Adapted from Life, Money and Illusion. The process of printing bills and minting coins presently creates only about three percent of the money supply. (It is significant that there is no debt involved in manufacturing coins and bills.) The rest of the money supply is created by large private banks. These private banks don't make coins or bills; they "create" money through credit/loans. For example, imagine that you have a business proposal and you need $100,000 to start up. You have convinced the bank that it is a sound proposal and they agree to loan the money. The bank doesn't give you the $100,000 from their depositor's savings. They create the money, out of nothing, by writing a credit line in your account book. "Presto!" With the stroke of a pen you can start withdrawing cash and writing cheques on that line of credit. The people you pay can spend the money you give them, or deposit it into their personal bank accounts, just like any other money they might receive. When you pay back the loan, the credit line is removed. The money the loan was paid back with is subtracted from the credit line and disappears. There is a catch, however. The bank wants interest on their loan. It created the principal, but it did not create any extra money from which the expense of interest charges could be paid. This is the cause of much hardship throughout society and around the world. While the system is complex, the basic problem is not. Consider four cowboys heading home after a long day on the range. Hot and tired, they drop by the local saloon to drink beer and play some cards. After ordering their beer, they ask the bartender if they can borrow some cards. "Of course," says the bartender. "But I'll need some collateral to make sure you return the cards; your horse or your saddle will do." To this he adds, "When you finish playing, I want you each to return 14 cards; one extra for interest." You can imagine what happens when the card game is over. In the economic parallel, as long as new loans are being taken out, more money is going into circulation, enabling earlier borrowers to earn enough to pay their interest charges. It is as if, back in the saloon, other people were borrowing additional decks of cards and the games they played intermingled with the other games in progress, in a way that enabled individuals to end up with more cards than they started with. While this would enable the first players to pay off their debts, it would leave an increased deficit for the players that followed, requiring even more people to borrow cards if collateral losses are to be avoided. As we shall see later on, this mechanism, when applied to lending money rather than cards, is a principal reason why our economic system is compelled to grow. The analogy with the cowboys differs from our monetary system on an important point. The cowboys can't make cards. Economic activity can and does make new wealth. We take natural resources (or products made from them) and make things or provide services of greater value. Over the years, however, compelled by the demands of this debt-based money system, the natural resources consumed, and the wastes produced have brought us up against planetary limits. It is as natural for a government to create and manage the money that enables its citizens to cooperate as it is for an organism to produce the blood that enables its cells to cooperate. A growing organism has to produce more blood to provide for the needs of its expanding community of cells, just as more money has to be put into circulation to keep the operations of a growing economy in balance. A traditional procedure for introducing new money into a growing economy has been deficit spending. That is, for governments to spend more money than they take in through taxes. Governments are often accused of mismanagement when they do this. We hear that deficit spending is the cause of inflation, yet the commercial media fails to mention, let alone criticize, the role private banks play in inflationary money creation. They receive much of the government deficit spending as deposits. The private banks can then use that money as a fractional reserve and multiply it many times over through loans, exerting many times as much inflationary pressure. The bias of this reporting is more apparent when we consider that government spending is primarily for public services through accounts that are open for public scrutiny, while the private bank income from multiplying the deficit are all funnelled directly into their private interests. No questions are asked. Why is there less concern voiced about the actions of institutions that are unreservedly committed to serving their private interests than there is for a public institution that is obliged to serve ours? In seeking to answer this question one might come to suspect the manipulation of public opinion. The money needed to expand the money supply through deficit spending can be created by the government itself through a national bank - like the Bank of Canada - or the government can borrow from private banks and let the private institutions create the money. Since 1975, government borrowing has increasingly been through the private banks. Because private banks charge interest for their loans, and keep that interest for their private dealings, creating money through them is costly. Canadian taxpayers provide billions of dollars annually in interest payments to private banks and their shareholders. We paid $37 billion on interest at the federal level in 2002. Not bad pay for bookkeeping, but Canadians have to wonder if they are getting as much value for this expenditure as they might. Over the years, these interest payments, along with interest on unpaid interest, have added up to hundreds of billions of dollars - an amount almost equal to the entire national debt. It is to pay the interest on this debt that health care, education, social services and other programs were cut back. It is worth noting also, that it would be a disaster if a government were to significantly pay down the national debt. Whether it is owed to private interests, or to our national bank, the money we use to trade is almost all created through debt. A great deal of money would disappear from circulation if those debts were paid back and a depression would likely follow. We could, however, borrow money from the Bank of Canada and use that money to pay back the loans from private banks. While the loans would continue to be outstanding, and money, therefore, still in circulation, the interest paid to the Bank of Canada instead of to private interests, would be returned to the public accounts less only the costs of accounting for the loans. When dealing with the challenges of World War II. Money was created by the Bank of Canada and lent to the government at 1.5 - 2% interest. This credit financed Canada's war effort, housed a flood of immigrants, rejuvenated infrastructure, encouraged new technology, and financed the transition from being a rural, agricultural country to an urban, industrial one. If the Bank of Canada had been used as intended - to finance the country's deficit spending - the hundreds of billions of dollars that have been paid as interest to private banks would have been paid instead to Canada's general revenue. The national debt, instead of being an expensive crisis, would be viewed as a significant portion of the nation's money supply. No extreme measures would be required. What was not spent on interest payments could be used to improve the quality of education, health care and environmental protection and to reduce taxes. "Once a nation parts with the control of its currency and credit, it matters not who makes the nation's laws. Usury, once in control, will wreck any nation. Until the control of the issue of currency and credit is restored to government and recognized as its most sacred responsibility, all talk of the sovereignty of parliament and of democracy is idle and futile." Note: The author of the "Money as Debt" series has a more detailed explanation of the problem.